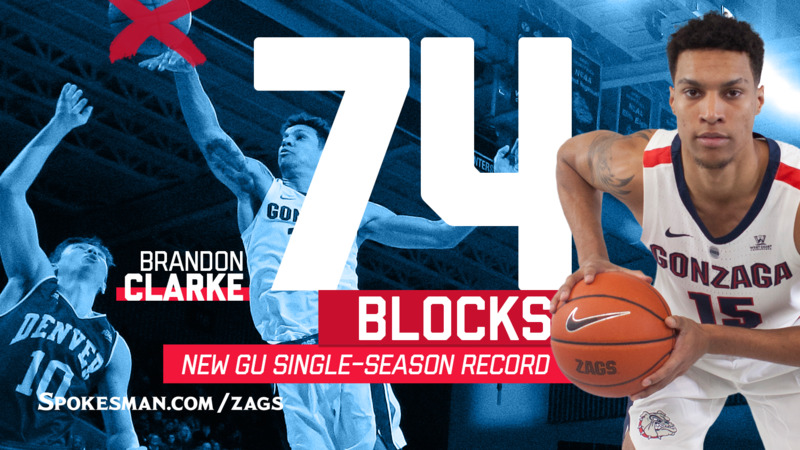 Gonzaga is just more than 75 percent of the way through its season, yet Brandon Clarke has found himself at the top of the Bulldogs’ single-season record books with 74 blocks. Before he stepped on to the floor of the Kennel, Clarke was a proven defender, earning first-team all-defensive honors for San Jose State two seasons ago. But no one in GU circles knew what sort of jump his game would take after a redshirt season. From the first day, it was clear what sort of defender he could be for the Zags. He is averaging three blocks a game this season, reaching his peak with six against Texas Southern in the second game of the season and Duke in the Maui Invitational championship game. There have been only three games this season in which Clarke has failed to block a shot, and two in which he had just one. Austin Daye held the top spot with 70 blocks (with a 2.1-per-game average) in the 2008-09 season. Published: Feb. 7, 2019, 9:46 p.m. Updated: Feb. 7, 2019, 11:27 p.m.